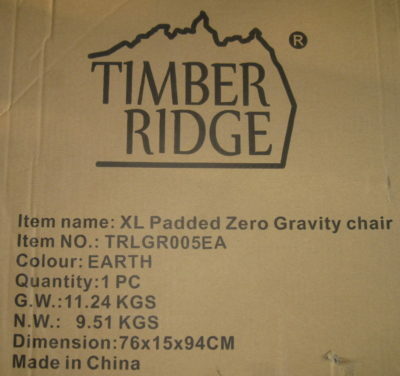 Timber Ridge XL Padded Zero Gravity chair provided for review. 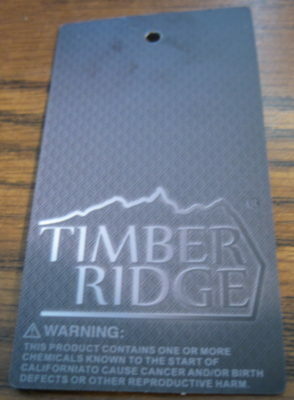 The Timber Ridge XL Padded Zero Gravity arrived in a cardboard box with minimal markings and shipping information. The packaging comprised of a cardboard box, a thin plastic bag covering the chair and two Styrofoam blocks for secure transportation. glue and tape to hold the cardboard box together. I slid the chair out of the box. I then picked up the chair from the back, the armrests slid down part way. I stepped to one side of the chair, and while holding the top of the back of chair, I applied a slight amount of pressure on the armrest until the armrests were sloping slightly upward toward the front of the chair. This is the normal chair position. I sat in the chair, checked that the locking mechanism under the armrests were released, put my feet on the front part of the chair near the floor and pushed forward to move the chair into the reclining positions. In the extended position my head was higher than my feet. The locks are easy to apply and as a recliner the chair can accommodate a wide range of positions. This chair has a detachable pillow that can be slid vertically on the back of the chair. The chair also had a detachable cup holder. 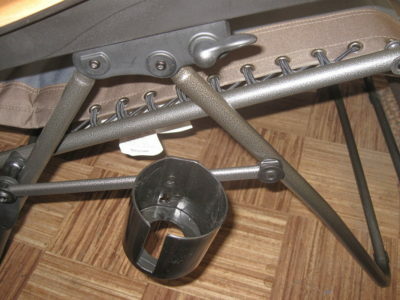 The cup holder has three holes in it so it can mount on the right side of the chair with a choice of two positions. A position for use as a chair and for the extended position so a beverage will level with the base of the chair. I did not find a manufacturer website for the Timber Ridge. An Internet search revealed many on-line retailers, such as Amazon.com, and many large stores that carry this brand. 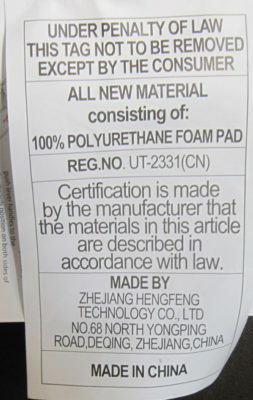 The only material mentioned on a tag sewed to the bottom of the chair reads, “All new material consisting of 100%: Polyurethane foam pad.” An instruction label and a warning hang tag. See pictures below. The armrest appear to be made of wood. The frame of the chair as tested with a magnet is magnetic. The padded material that provides the body contact part of the chair is held in place with a stretchable cord. The cord is looped through eyelets on the padded material and a heavy metal wire that was spot welded to the frame of the chair on the sides. The top of the padded material forms a loop over the top back of the chair and is sewn. Wood surfaces are smooth with a non-glare finish. Metal appears to have a baked enamel finish. Cup holder feels like semi-rigid plastic. Spot welds appear to be welded by an automated process. Since on the shipping box were the box measurements I measured dimensions for the chair in normal position and fully extended position. Getting on and off the chair was from the upright position. I found it to easy and quick to move into the upright position from an inclined position. Since this is a patio chair, the next phase of testing will be outside. The chair will be exposed to sun and rain, I will also be using it in warmer conditions. I will also check a few different surfaces. I will also be comparing this recliner to my upholstered recliner chairs. I like the comfort. If the idea that the weight of this chair is a factor they do have a chair with an aluminum frame which should be a lot lighter. I did not know the weight of this chair until I saw it on the container. This will be a limitation when carrying distances become a factor. It is larger than the standard non-recliner chair. This could be a factor in cars with small storage places. One of the good features is that it is a recliner chair that requires less space than most upholstered recliner chairs. I like the smooth action of the chair. 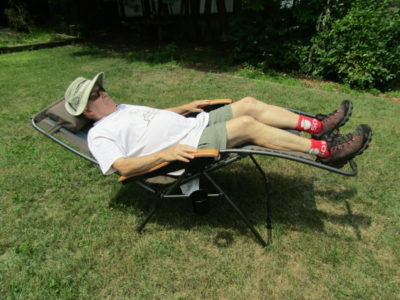 I wish to thank 4allouutdoogs.org and Timber Ridge for the opportunity to test the XL Padded Zero Gravity chair. Please check back in about a month when I will have more to say. This period has been hot, hazy and humid. Hot here is high 80s to high 90s. Along with a humidity of 85-90%. 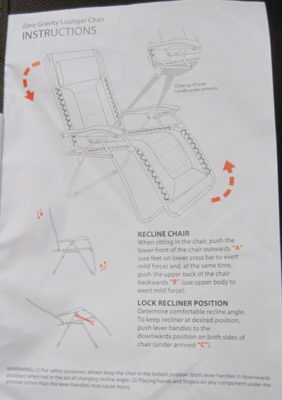 I will look at the cup holder, and how I used the Timber Ridge XL Padded Zero Gravity chair. Being left-handed, I noticed the mounting hardware for the cup is on the right side. The cup holder mounting bracket is mounted on a support arm. It appears the support arm on the right and left side are the same. This is not a big deal, but having the option of a cup holder on the left would be nice for left-handed people and those who have lost use of their right hand. I can position the cup holder in two positions, vertical for the sitting position of the chair and tilted for when the chair is in recliner mode. The inside diameter and height of the cup holder is about 3.5 in (8.9 cm). There is a slot on the cup holder to accommodate cups with handles. I looked around my house and found only two cups that did not fit the cup holder. One was an old style Dunkin-Donuts plastic coffee cup, and the other was a clear plastic cup that was a little too big. I also tried cups and water bottles of various heights. I had a handless coffee cup that was 11 in height and a water bottle was also about 11 in (27.9 cm) height and it held a Liter of fluid. I would not want to use cups more than 11 in (27.9 cm) high in this holder. I am a left hander that can use my right hand for this kind of maneuvering. I have tried using the cup while sitting and while in the extended position. I had no problems. If you have a recliner and it is not where you want it to be, it’s not an easy task to move it to another location if you want to go to another floor or outside. I could move this chair outside, upstairs, or down to the cellar quicker than moving a wooden kitchen chair. After moving the chair outside, it was quick and easy to stay out of the sun. This summer there were several quick heavy showers. In less than a minute after the sky darkened, it was pouring. My cellar turned out to be the coolest place to be on the high 90s days. A problem I have in most chairs, or even recliners, is being able to sit in the same spot for a long period. However with this recliner I can set the exact position I want, lock it and I’m good for a few hours. My record is four hours so far. The locking mechanism is quick, easy, and requires little effort to set or release. I have tried napping in this chair, it is as good as my other recliners. My problem is I am a side sleeper and I have never been in a recliner that I could side sleep in. I have taken naps of about an hour in this chair, and, when I wake, I feel refreshed and have no discomfort. I like the overall comfort of the chair. The chair has a slight give and is similar to a firm mattress which I really like. It is almost like being on one of my backpacking lightweight pads. I have noticed a couple things. I have a buzz cut and the straight hairs on my head get into the pillow on the chair. It sometimes feels weird when I turn my head. If this becomes a problem, I will put a towel over the problem area. I have been in this chair in the high 80’s with a lot of humidity. I have not noticed getting hot in this chair. I am pleasantly surprised with this chair. It has improved the quality of my life, but it will not replace my bed. In the next month of testing this chair, I hope to have an interesting story to read on my Kindle while in this chair. I wish to thank 4allouutdoogs.org and Timber Ridge for the opportunity to test the XL Padded Zero Gravity chair. Please check back in about a month when I will have more to say in my last look. 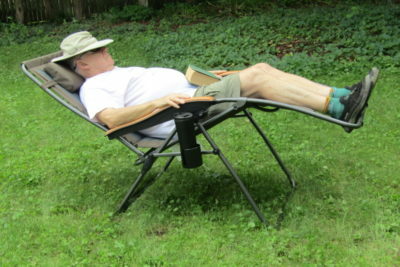 I continued to use the Timber Ridge XL Padded Zero Gravity chair during this period for reading, using a laptop computer, meditation, and naps. The weather improved in this period but the humidity remained high and uncomfortable. I also received a couple inquiries I will explain further. The first inquiry asked me if I thought this chair was good for their back. That is a question I cannot answer. I can say that I had back issues about 15 years ago. There are chairs and beds that are not comfortable for me, however I did not experience any back problems when using this chair. What I know for sure is that it worked well for my back. The second inquiry was whether it was easy to get in and out of the chair. I always get into this chair with it in the upright position. My feet are resting on the movable part of the frame. I apply a slight pressure away from the chair with my feet and the movable part of the chair glides from the sitting position to an almost horizontal position. I used both regular shoes and slippers. My slippers have a firm base like a shoe. I could not tell any difference between using shoes or my slippers. Instead of slippers I tried using the chair with a pair of thin socks. I tried using my heel and arch to move the frame. There was a slight momentary discomfort to get the motion started. This reduced if I leaned back at the same time my feet were pushing forward. After a few uses in my stocking feet, I found that it worked best to open the chair with the frame positioned where the heel of my foot joins the arch while leaning back as I applied forward pressure with my feet. When reversing the process, I used the back part of my heel while leaning forward as I pulled back with my heel. I tried using my I-Pod, I-Pad, 8 inch Kindle, or a 17 inch eight pound laptop. I found no difference using them on this chair compared to any other chair I have used in my house or anywhere outside my house. I have never liked using this heavy laptop on my lap in any chair. Except for the laptop, I liked using all the other devices in this chair. 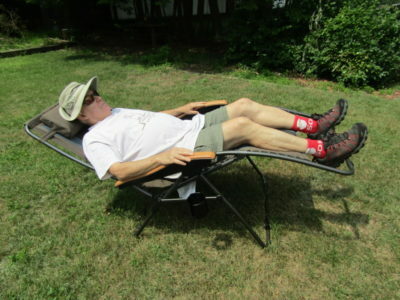 Using the Timber Ridge XL Padded Zero Gravity chair as a recliner is outstanding. It boils down to mobility. My imitation leather covered or my fabric covered recliner are very stationary. They are difficult to move even short distances. Going from room to room is even more difficult. Changing from one floor to another, or going outside was out of the question. It is so nice to fold this chair and move it to another location, room, floor, or even outside. If you get stuck outside in a downpour you don’t have to worry about this chair getting wet because it dries or it can be moved easily to a dry location. After two months of use the chair functions as smoothly as it did on my first use. The steel version that I am using is a little heavy. For those wanting something lighter there is an aluminum version. 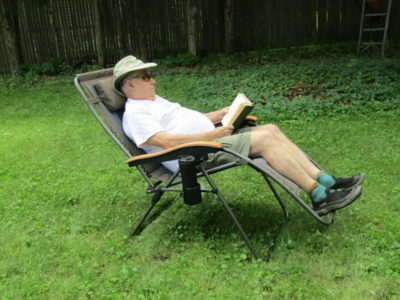 I have used the chair, to read, meditate, and take naps. I have always been comfortable using this chair. I wish to thank 4allouutdoogs.org and Timber Ridge for the opportunity to test the XL Padded Zero Gravity chair.